Guanciale is the “localest” (yep, my English teacher would freak out right now) Roman ingredient. It’s pure seductive deliciousness with a unique flavor. You might think it’s like bacon, but it’s not, it’s guanciale, and it’s very, very, different. Bacon comes from the belly of the pork, guanciale comes from the neck and cheek, and even though they come from the same animal, they are nothing alike. The succulent fat of the guanciale melts away upon cooking, giving great depth of flavor to the dish it is used for. It is the soul of the classical Roman pasta dishes like Carbonara, Amatriciana and, Gricia, and if you were to tell a Roman that bacon will do, you would probably get a horrified look. It’s hard to find guanciale outside of Italy and believe it or not, there are regions in Italy that don’t even know of its existence. This is another reason to always go local when you explore this country’s food and wine. You bump into culinary marvels that will blow your mind away, giving your palate an experience it will never forget! Guanciale will certainly be one of them! 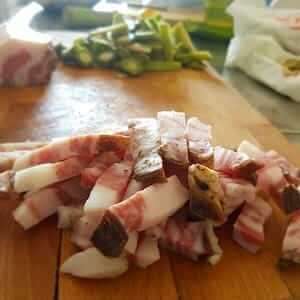 You can sample real guanciale (and taste the difference it makes) on our 4 Roman Pastas Tasting Tour, try the four iconic Roman pasta dishes in one unique dinner experience. When in Rome don't miss the opportunity to try guanciale, a flavorsome, fatty cured meat from the cheek of the pork. Guanciale is the key ingredient in Roman cooking.